Practice questions to help prepare for MCAT. With the help of this guide, you will easily pass your post-secondary course on biochemistry. Mr. Donelly has 17 years experience as a university professor. This study aid will help you explore biochemistry in more straightforward terms to help you succeed in your course. Each chapter will overview relevant terms, explain the concept in easy-to-understand words, and have questions for you to answer. Organic chemistry is a difficult subject. 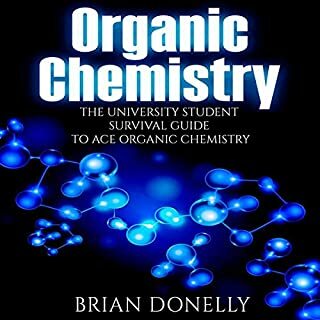 To help you understand the subject with ease, Organic Chemistry, a guide to help you ace and survive the course, is available. This study aid will help you explore biochemistry in more straightforward terms to help you succeed in your course. 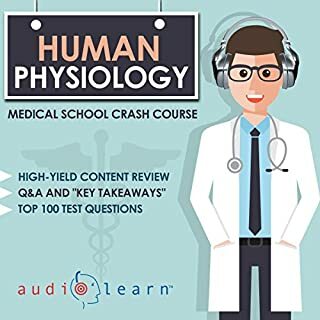 You may not need every chapter in this audio textbook depending on when you pick it up. However, it is encouraged that you use it for a review as your final edges closer to help you re-examine concepts that may have been tough in the beginning weeks of class. 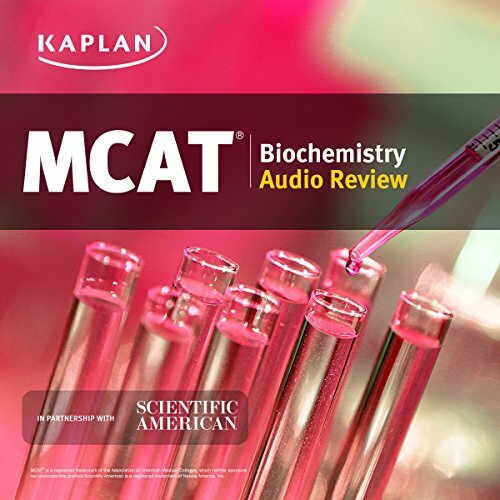 From the makers of the number-one MCAT course, Kaplan's MCAT Biochemistry Audio Review is designed to fit into times when you couldn't otherwise study - whether on the road, at the gym, or just looking for a change of pace from reading a textbook. Each of the 12 chapters, which, combined, cover the full scope of MCAT biochemistry, is a multihour conversation with some of Kaplan's best biochemistry minds, where they share their deep knowledge of the content, their experience with students, and all their most effective learning techniques as they go along. Their conversations, hosted by Jeffrey Koetje, MD, are structured and informative but also open and casual, almost as if they're reviewing the material themselves and you've joined their study group. By the end of this audio course, you'll hear their take on the best ways to learn and remember all the biochemistry (and much of the molecular biology) you need to know for the MCAT, including amino acids, plasma membranes, cell metabolism, and much more. 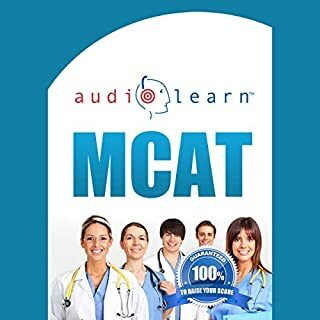 You can listen to it on the go, follow along, and take notes with the MCAT Biochemistry Audio Workbook (included as digital download, but also available in print), or even integrate this into a larger course of study with Kaplan's MCAT Complete 7-Book Subject Review - however you study, you'll enjoy the fresh and memorable perspective on this important material that you'll use on the MCAT, in medical school, and beyond. I can’t recommend this enough. Not too many people know about this but this is a wonderful resource for biochemistry for MCAT. It’s surprisingly fun given how dense the information they throw at us. The speakers are knowledgeable and have a sense of humor which makes it entertaining but informative at the same time. I listen to this at work or when I’m commuting and it helps tremendously with my busy work schedule while having to study. I especially enjoyed the last few chapters about metabolism which is extremely high yield and difficult. They broke the processes down in a way that I’m now not only strictly memorizing the details but also understanding and enjoying them. Thank you for making this! This plays a lot like a podcast which I believe is the intent of the authors. The topics are extremely important for mcat or medical school biochemistry. Its probably enough to give a premed what they need for the mcat if they have/haven't had a biochemistry course. It's not enough for a Medical Students review. At 30ish hours its long and not worth a medical student's time. That may sound obvious but I want to say it for anyone who might be thinking about getting this. Some audio is recorded over calls/skype and is lacking. I would make sure to use the pdf or another biochemistry book to follow along and actually learn the material. JUST LISTENING WILL NOT GET YOU MANY POINTS. It won't because you need to more than a cursory look at the material and they don't really get 'into the weeds' with anything. TLDR: Good for premeds, med students can find a better use of 30 hours. awesome but where is the companion pdf ? I love this book. If you're studying and are pressed for time, please use this book! Dr. K is a great lecturer. Kaplan MCAT Biochemistry Audio Review does the best job with bio and biochemistry (no I am not a sponsor or bot; I'm a broke pre-med). Good Luck! Very helpful dialogue for biochemistry! Not only does this bring this usually boring subject to a fascinating and interesting life, the presenters are knowledgeable and enjoyable to listen to, their actual voices are pleasant and can be listened to on many different speeds. The work/review book is a strong necessity for full comprehension of the little details but even as a stand-alone piece nothing comes close to this. A huge thank you to the entire Kaplan team! loved it. It was engaging and lively. They keep it connected by using tons of real world examples. More of a convoluted "podcast"/review with way too many extraneous comments, and too few concrete high yield topic discussions. I understand that Kaplan is trying multiple different study materials, and this is a great start. However, a more thought-out and lively/engaging script would be far more beneficial. 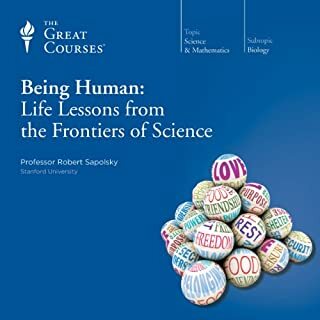 The girl talking about DNA and lab-technique concepts was actually very helpful and her anecdotes helped me remember some stuff on test day. When she wasn't talking, it was difficult not to fall asleep. And I took Biochemistry I and II, and an upper division biochemistry class in undergrad. I wouldn't buy it again unless Kaplan completely changed their approach. Very enjoyable. Easy to understand and remember. Wish they had all the other MCAT preparation books in this format. I'd buy them all!